Reggie Gazes is an assistant professor of psychology and animal behaviour at Bucknell University in Lewisburg Pennsylvania. Reggie has a BS from Bucknell in Animal Behaviour and a PhD from Emory University where she worked under the supervision of Rob Hampton. I first met Reggie at CO3 a few years back through Rob. Rob and I were students in Sara Shettleworth's lab in the 90s. (As usual, I can turn any of these posts into posts about me). Reggie later did a postdoc at Zoo Atlanta. Her work looks at the evolutionary roots of behaviour and cognition using a comparative approach. 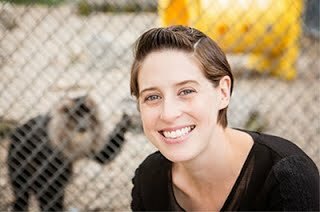 She and her students look at things like memory, space and magnitude in four different species of primates (capuchin and squirrel monkeys as well as Hamadryas baboons and lion tailed macaques). The social housing they use allows them to look at social stuff as well. We talked about her work about transitive inference in infants and monkeys as well as a bunch of other stuff.